While anyone can get melanoma, certain individuals are more likely to develop this form of skin cancer. It is important to understand the causes and risks factors of developing melanoma. Early treatment of melanoma offers the best chance of a full recovery. Make an appointment with one of our skin doctors at our Melanoma Center if you notice any of the symptoms of skin cancer. At this time, scientists have not identified the exact cause of melanoma. While extensive research into the cause of melanoma has been performed, we still don’t know why some moles develop into melanoma while the vast majority of them do not. Researches do know that certain changes in our cells’ DNA can cause normal cells to become cancerous. While the exact cause has not been established, researches have been able to identify risk factors for melanoma. Below we have listed the known risk factors for melanoma. This list is based upon the latest scientific evidence and our collective experience in diagnosing and treating patients with melanoma. Exposure to ultraviolet (UV) rays is a major risk factor for developing melanoma. UV rays can damage the DNA in skin cells, which can lead to cancerous growth. While the sun is the main source of UV rays, sun lamps and tanning beds also emit UV rays. Researches have observed that melanomas on sun-exposed areas of the body (e.g. face and arms) are different from melanomas that occur on less exposed areas (e.g. chest and back). This may have to do with the amount, duration, and intensity of exposure to UV rays. colors are more at risk for melanoma than others individuals. Melanoma is more often diagnosed in older people. In recent years, however, doctors have been seeing more and more cases occur in patients under 30, particularly in those with a family history of melanoma. In general, melanoma is more commonly seen in men, but the risk varies by age. Women under the age of 45 are more likely to develop melanoma than men, whereas men over the age of 45 have a higher risk than women. 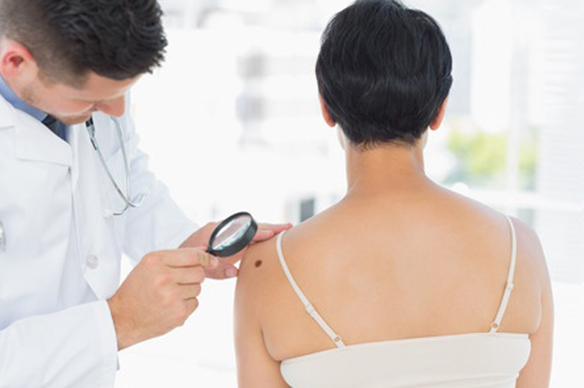 While the chance of a mole developing into melanoma is very low, researchers have established that people with many moles are more likely to develop melanoma than other people. Certain types of moles are more likely to turn into melanoma. These include atypical moles (dysplastic nevi), which are moles with an abnormal shape or color, and congenital melanocytic moles, a type of mole that is present at birth. Individuals with XP, a very rare, genetic condition, have a high risk of developing melanoma and other types of skin cancer, when they are young. XP is a defect of the body’s ability to repair DNA damaged from UV rays causing sensitivity to sunlight and increased risk for skin cancer. Anyone with a family history or a diagnosis of XP will need to be very carefully monitored so any signs of cancer can be treated promptly.